Recently strange mockup surfaced to accompany strong rumors of new Pentax reentry to mirrroless market. that's a curious one. I'm not sure about the protruding viewfinder. Maybe its removable? APSC I guess. Any specs? 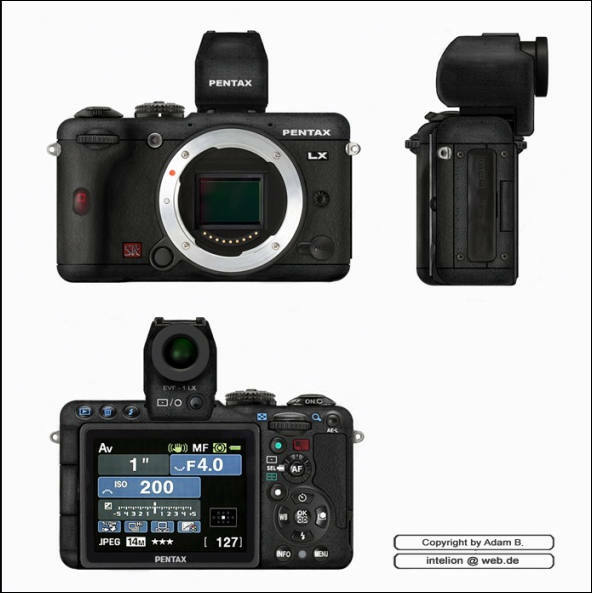 If you ask me, Pentax must make ugly, cheap FF mirrorless camera with full sensor 24mp at 60fps recording. I'm surprised Pentax is still doing well enough to make another gamble on mirrorless. Fake. One people noticed in Mirrorlessrumors: "When they photoshopped the mode selector dial from the K-5, they forgot that moving it from the left side of the camera to the right means that the indicator mark has to still be on the right side. Otherwise the label of the selected mode will be upside down." No one though that picture above is real. It is just illustration to rumors about upcoming mirrorless camera.